At Reliance AGM, Mukesh Ambani finally broke the silence on the tariffs for Reliance Jio. The company will not be charging for voice calls at all, and it will charge a tenth of what its competitors are charging for 4G data, Ambani said – it was announced that Jio will charge only 5 paise per MB, or Rs. 50 per GB. What’s more, the greater the usage, the lower the cost will be, and the rates could go down to Rs. 25 per GB. 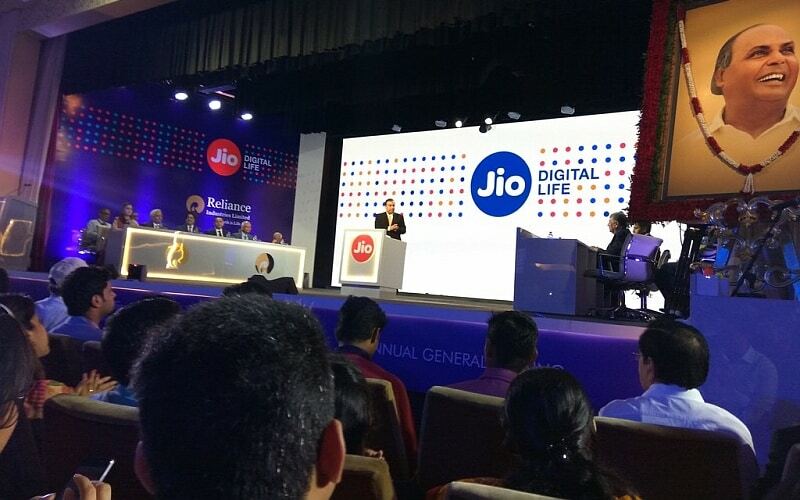 At the AGM, Ambani also announced that Jio services will become available from Monday, September 5, absolutely free as part of the ‘Jio welcome offer’, so everyone can try Jio’s services at no charge. The Jio 4G tariffs start at Rs. 149 for 28 days, for 300MB. For Rs. 499 per month you get a big step up, to 4GB of 4G data, plus unlimited 4G at night, for 28 days. You’ll also get 8GB of access from Reliance Jio’s upcoming network of Wi-Fi hotspots, further increasing the amount of data you can use. For Rs. 999, that goes up to 10GB of 4G data, and 20GB of Wi-Fi usage, plus unlimited usage at night. Further plans are for Rs. 1,499 for 20GB, Rs. 2,499 for 35GB, and Rs. 3,999 for 60GB of 4G data, and twice as much Wi-Fi usage respectively. The most expensive plan is for Rs. 4,999 for 75GB of 4G usage plus unlimited 4G usage at night, and 150GB of Wi-Fi data. 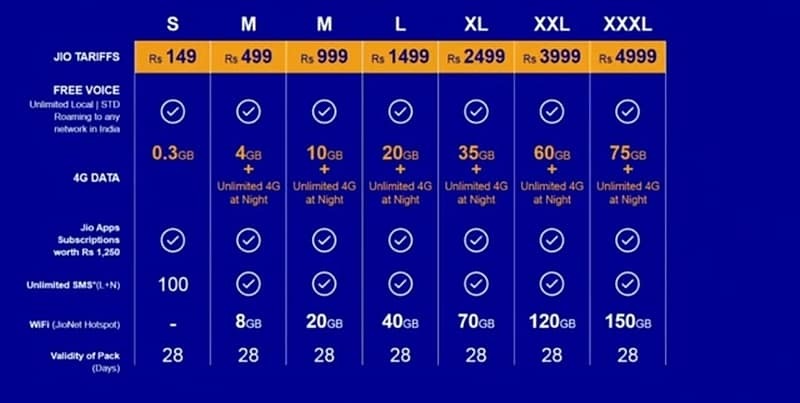 These are all pre-paid tariffs, and Jio has not revealed its post-paid plans. Going by these plans, the rates are actually a little different from the Rs. 50 for 1GB that was announced. The cheapest plan is actually a lot more expensive – you get 300MB of data for Rs. 149, or around Rs. 450 per GB. However, with the other plans, once you count the Wi-Fi hotspot data as well, it does work out to the rate that was announced – for example, the Rs. 499 pack gives you a total of 12GB including Wi-Fi, which works out to approximately Rs. 42 per GB. The bigger packs do get cheaper this way, so for example, the most expensive Rs. 4,999 pack gives you 225GB of data including Wi-Fi, which works out to approximately Rs. 23 per GB. And this does not account for the unlimited 4G at night you will get as well. There will also be no roaming charges, across India, to any network, it was announced. “Put an end to all voice call charges for all voice calls that are domestic,” Ambani said. This applies to calls to other networks as well, not just calls within the network. He also added that data must be affordable for all users. “Current market practice is to charge for data a base rate between Rs. 4,000 and Rs. 10,000 – Jio will have a base rate which is 1/10th of this,” Ambani said. “Our data plans go even further with an effective rate of 5p/MB or Rs. 50/ GB.” Students will get 25 percent extra data on the tariffs, if they show a valid ID when signing up for Jio. Apart from the data rates, Ambani also announced that the full suite of Jio apps – for streaming movies, music, and live television – will be completely free for all users until December 2017.